After many months of living in Shanghai I finally left the city. 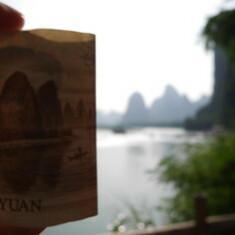 I took a couple days off flew to Guilin then by bus went on to Yangshuo. I did some sightseeing, took some pictures, even did some mountain biking. I should have taken more time off and done more, but I had limited funds, it is clear I need to find a better job. One look at my resume and you can see why. I should have spent another night in Guilin, actually saw some of the city instead of just the airport, train station, and bus depot. To get to Yangshuo you must take a bus over a less than stellar road. It is hot and crowded. I was surprised that a girl in the seat in front of me started vomiting before we’d even put Guilin in our rearview mirror. The roads are actually paved, but I guess there are some rough patches and some roads in Guangxi are definitely not paved. I also did not make it to the Dragon’s Backbone Rice Terraces, instead I stayed another day in Yangshuo and went mountain biking with Bike Asia. 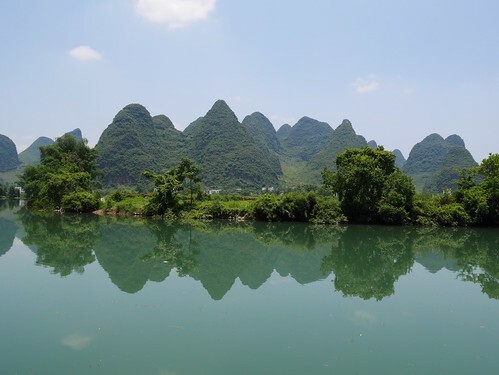 I didn’t do a lot of things that are popular in Yangshuo, rock climbing, bamboo rafting, I didn’t even take a cruise, though I did jump in the river. I never closed down any bars but I drank more than one or two German beers. I think a lot of German rock climbers and cyclists must have gone through town at one point, because the town didn’t seem that Germanic but you would think you were in Bavaria by the beer list at some places. 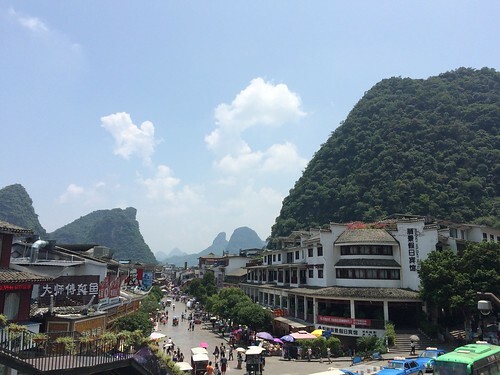 Yangshuo is small but the streets are full at night, Saturday night is the most crowded. I stayed at the Magnolia Hotel which looks peaceful but is on a very busy street corner for Yangshuo. If you want a good nights sleep, listen to the Lonely Planet and stay outside of town. You’ll have to pay a lot more in taxis or rent a bike everyday, but you’ll sleep better than I did. As the first picture implies I did take a bus to Xingping and saw the exact mountains and rivers that appear on the 20 RMB bill. I even spent many minutes trying to line up the perfect photo in the blaring sun. I didn’t get the perfect photo, a tripod would definitely help, but I did take some good photos with my Panasonic DMC-GM1 as well as my iPhone while on this trip. 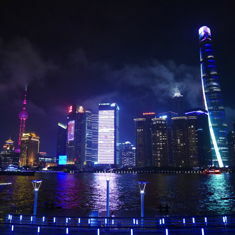 I’ll have to take a proper photowalk through Shanghai but I am just tired and busy all the time. It took me several days of fighting the Chinese Internet to get my photos and then this blog post online. I tracked my rides with CycleMeter which did a really good job considering I was in the backwoods of Southern China. There wasn’t much elevation to my ride, but lots of rocks that had to be ridden over, the sorest part of me at the end of my 50km ride were the palms of my hand. Meanwhile back in North America, my sister and her dogs are on an epic trip to Alaska. My sister might come visit me in Asia if the stars align, but in the mean time you can follow the Adventures of Curious E. George over on WordPress.com. George has actually been lost in the Alaska wilderness, OK Fairbanks. 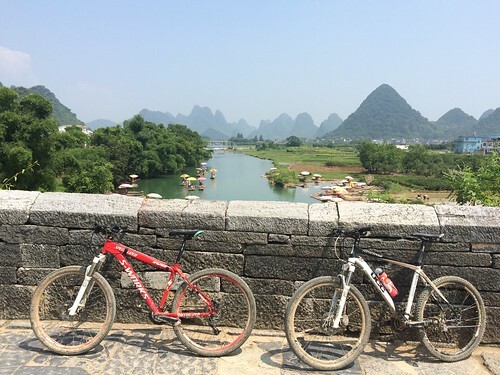 This entry was originaly posted on July 17th, 2015 , it was last edited on January 28th, 2019 and is filed under: Asia and tagged: China, Guangxi, Mountain Biking, Xingping, Yangshuo.